The CS1000 Recording Bundle is a recording package from Studio Projects that contains a Studio Projects CS1 microphone, an XLR cable, a windscreen, a shock mount, and a storage pouch and case. 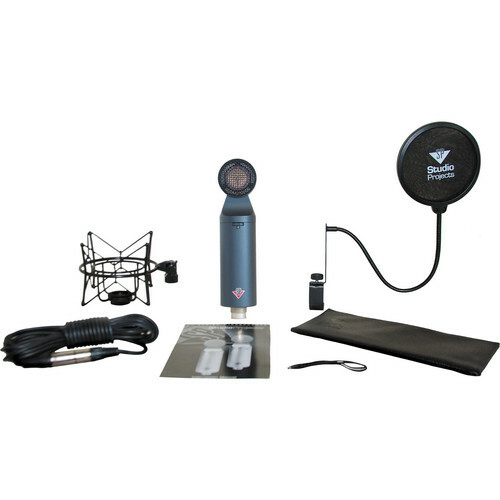 The CS1 is an externally polarized cardioid pressure gradient transducer microphone with a FET impedance converter. The mic has a 1.06" (27mm) capsule, with a diaphragm thickness of 6µm. It features four selectable pads, four high pass filters, and four low pass filters for added control in various recording applications. Box Dimensions (LxWxH) 17.7 x 10.5 x 7.3"